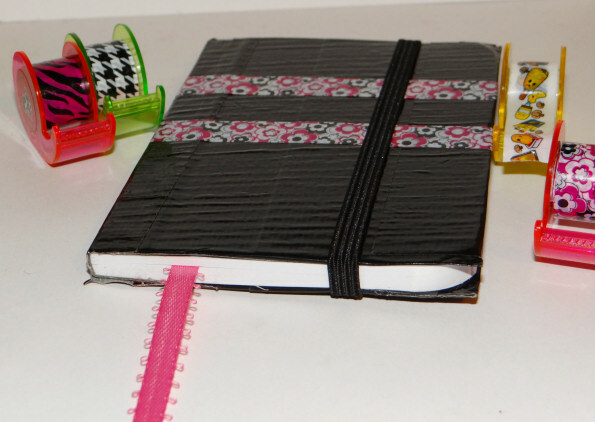 Tapeffiti™ is a decorative tape that comes on the cutest mini-dispensers ever made by Fashion Angels. 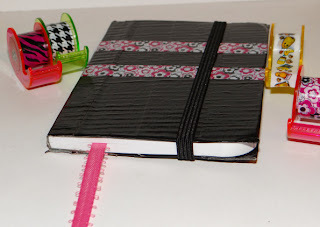 Recently I had the chance to try the Tapeffiti 30 Decorative Tape Roll Set (Fashion Angels link)- the set comes with a wide variety of designs that can be used on all sorts of things. The first thing I wanted to do was a decorated mini comp book. 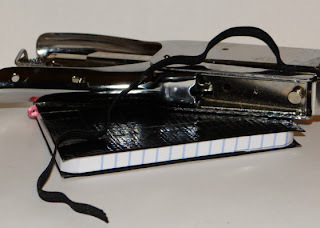 I use mini comp books to write down ideas while out and about. Actually, the first thing I did after pulling out the supplies was offer The Amazing Turnip Girl her choice of tapes that I'd leave for her. The 30 kinds of tape have all sorts of designs, super kawaii, pretty flowers like I used above, some lacy effects, a mini caution tape, a herringbone, animal prints in bright colors. 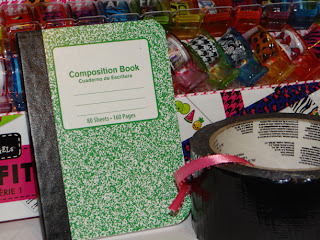 Just a lot of selection which makes this a good project for tween parties. The nice thing about customizing these little notebooks is you can add in helpful details like an elastic band to keep it closed in your purse and a ribbon bookmark to make it easy to find the page you're on. Cut a piece of duct tape the same length as your notebook, and line up the ribbon on the back of the book against right along the spine. Tape over the spine of the notebook and ribbon. 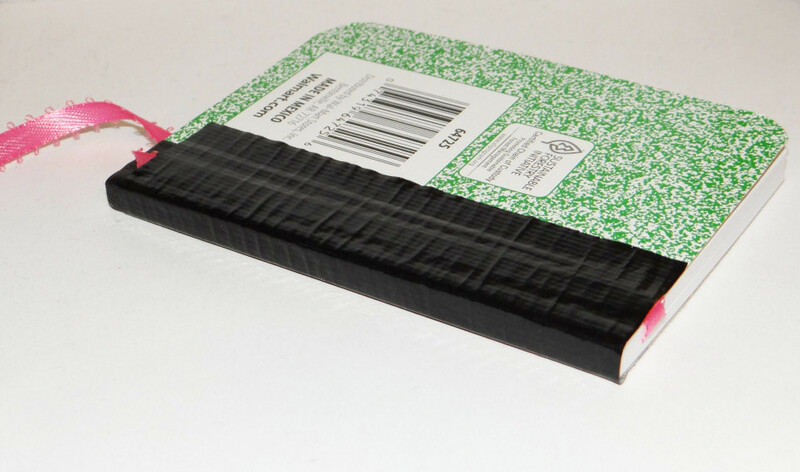 Now you'll cover the whole notebook in duct tape. I've found the best way is to do the outside cover first, cutting length that wrap around to the inside. Burnish it down, then cut 3 lengths the same length of the notebook, fold 1 over each long edge of the cover, then 1 more around the spine. 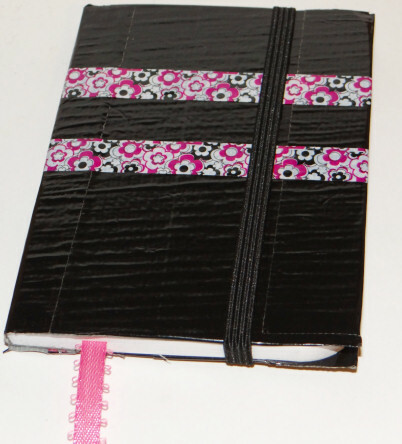 After that, cut shorter lengths to do the inside, covering the tape ends from the outside cover. 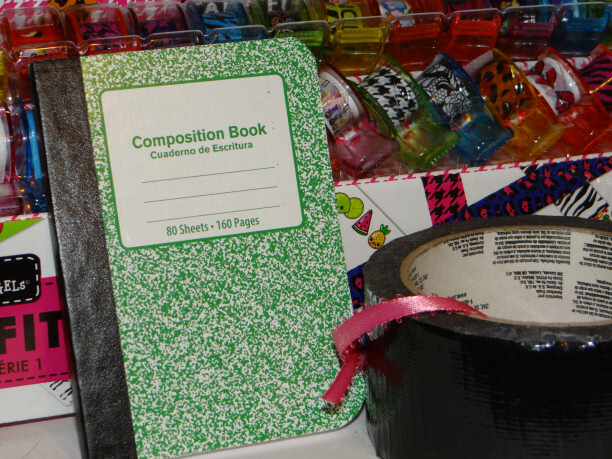 After it's covered, wrap the notebook lengthwise with a piece of elastic, pulling it just a little bit tight. Cut it with a half inch overlap, then center that overlap about an inch away from the edge on the back cover, and staple it into place. I like my staple pliers (Amazon) for this because they are heavy duty enough to go through the tape, elastic and cardboard. Now the fun part! Decorating with the Tapeffiti™ . You can cover the staple if you'd like, I did. Or you could put it on vertically or diagonally. This part is completely up to your imagination. I'm certain that TG will do something very different from what I did. TG loves the tapes too. Check out Fashion Angels on Facebook! They are planning to do a giveaway when they hit 5000 fans and they are so close. They have lots of great craft items for kids and you can see a really great dress made using Tapeffiti on there as well. Fashion Angels provided the Tapefitti™ at no cost for use in a project and for review purposes. No other compensation was given, and the opinions expressed here are my own. All Amazon links are affiliate links, if you use them, it will help support this site. The scissors and stapler are the brands and styles I used in making this project.